Cedi to lose three zeros ? 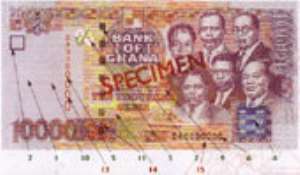 The launch of the new Ghanaian currency will take place late this year. Ghanaians accustomed to prices in thousands, even millions of cedis should expect new banknotes stripped of three zeros; a break with years of economic crisis and a move to what many hope will be a brighter future. Under the slimlined currency, kenkey will sell for about 4 New Ghanaian cedis, instead of 4,000 old-style. Ghana's currency is something of a symbol of national disgrace, bamboozling foreign visitors and reminding Ghanaians of three decades of hyperinflation. Inflation has fallen from 59 percent in the mid-1990s to 12%.